London Vet Clinic | 86 York Street, London W1H 1QS - How Far Do You Go? Advances in diagnostics and treatments such as those we use at the London Veterinary Clinic are there to extend the lives of our pets. All of us here have our own pets. We feel that ‘quality of life’ is almost always far more important than ‘quantity of life’. The moral dilemma this brings is how far should we go, using the modern technological advances of medicine, to prolong the lives of our pets? They have no say in the decisions we’re making about their treatments. Is it fair for a pet to have continuing treatment when a cure is not possible? Can we be sure that what we think of as a ‘treatment’ is not equivalent to a ‘medical assault’? How do we make safe decisions? Two pets may have identical conditions but their circumstances may suggest two opposite decisions. For example, a goofball dog that loves visiting the vet’s because he or she gets food treats and cuddles is an ideal candidate for weekly intravenous chemotherapy while a fretful, anxious individual may not be. There are no black and white answers when we’re faced with these hard decisions. Put in crude financial terms we have no interest whatsoever in deriving income by undertaking treatments that distress pets. We feel these are morally wrong. Sometimes, a little short term distress or upset may be worth enduring if the outcome is a more than commensurate enhancement of life. Whatever the circumstances, we will help you through with your decision-making. At the London Veterinary Clinic, small as we are we have an Ethics Group, with cumulatively far in excess of one hundred years of clinical experience, that oversees the decisions you and we make concerning on-going treatments for your dog or cat. Inevitably, through illness or aging a pet is no longer able to cope with the essentials of life. When it is decision time we will help you. Euthanasia means voluntarily ending the life of an individual. The word comes from the Greek “eu” which means good and “thanatos” which means death. For those who have watched a cat or dog quickly fall asleep and then seconds later see his or her heart stop, the procedure is aptly named. It is a good death. It’s also the most common way dogs die in London. In the UK, 52 per cent of all dogs are euthanased. Another 42 per cent die from illnesses or diseases, while five per cent died traumatically from accidents and one per cent are put down because of behaviour problems. Is the condition prolonged, recurring or getting worse? Is the condition no longer responding to treatment? Is my pet in pain or otherwise suffering either physically or mentally? Is it no longer possible to alleviate pain or suffering? If my pet recovers, is he or she likely to be critically ill, invalid or unable to care for him or herself? If my pet recovers will there be severe personality changes? If the answer to all these questions is “yes” then euthanasia is an honest, simple and humane solution. If however, you answer “no” to several of these questions, then you can ask yourself the following. Can I provide the necessary care? Will providing this care seriously interfere with or create serious problems for myself and my family? Will the cost of treatment be unbearably expensive? If you think of your pet as we do of ours, your pet is a member of your family. The decision is yours and your family’s, not ours although we have personal and clinical experience we can provide to help you with your decision. In our experience these are valid reasons for euthanasia. Overwhelming physical injury unlikely to repair well. Irreversible disease that has progressed to a point where distress or discomfort can’t be controlled. 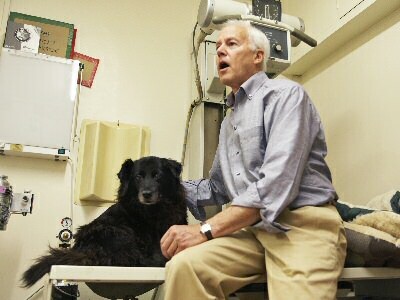 Old age wear and tear that permanently affects your pet’s quality of life. Physical injury, disease or wear and tear resulting in permanent loss of control of body functions. Uncontrollable aggressiveness with risk to children, you or others. Carrying an untreatable disease dangerous to people. The simple anaesthetic agent phenobarbitone is the most commonly used euthanasia agent. It’s given intravenously in a concentrated form. Although some people feel their pet knows what’s happening they don’t. That assumption is more a part of our guilt feelings than it is of the reality of what dogs and cats are capable of. All a pet knows is that someone is holding its leg – something that’s happened before when a blood sample was taken or a drug given intravenously and then it feels sleepy. It loses consciousness within seconds and within a few more seconds its heart stops. Depending on the circumstances, a sedative is given before the barbiturate, then a cannula is put in a vein to ensure that all goes smoothly. Brain death occurs within seconds but electrical activity in muscles can last for several more minutes. If the respiratory muscles are affected there can be a reflex contraction of the diaphragm producing a “gasp”, as if the pet were still alive. It isn’t. This type of reflex muscle activity may cause muscle twitches for up to ten minutes. We usually arrange for cremation unless you prefer burial. Many people ask for the ashes to be returned to them. Others bury their pets in their own gardens or in pet cemeteries. If you bury your pet make sure the body is wrapped in biodegradable material such as a cotton sheet. The grave should be deep enough so that foxes can’t dig. This usually means around a metre. Non-pet owners sometimes find it difficult to understand how awful it can be when a smelly old pet with some pretty disgusting habits, but a thinking, feeling being you’ve shared a decade or more with, dies. Don’t feel embarrassed, that the death of a pet triggers raw, wrenching emotion. That’s normal. Anger, denial, anxiety, all the emotions we experience when we lose a human friend are part of the grieving process when our pets die. If you’re an average pet owner, the stages of grief, from disbelief through to resolution typically evolve for almost a year. And while we are involved in euthanasias every week we get more letters of thanks from you, for ending lives properly, than we get for saving lives.